5 years after the earthquake, Ayiti p’ap péri! Fig. 1: Site of the former Petionville Club Camp. At its height, the camp was home to 55,000 internally displaced persons. Since being cleared in 2014 through the relocation of families by J/P Haitian Relief Organization (J/P HRO), it currently offers a sublime view of the sun sinking into the Gulf of Gonâve. Photo by the author. Today is the fifth anniversary of the January 12, 2010 earthquake which rocked Haiti. After reports on moments of silence observed, and reflections of that fateful day, you will have, by now, read or hear several accounts of Haiti today. How far the nation is still behind. How ineffective international aid has been, how it has been misallocated, how many homes were built or not built, and how many still must be built to reach the thousands still languishing in temporary camps. How the government disappoints – its lack of capacity, the corruption, the re-appearance of unwelcome ghosts from the past (especially “Baby Doc” Duvalier, who returned in 2011 after an absence of nearly 25 years, and died there in 2014), and the specter of authoritarian rule. You will have already read or heard all the reasons why not enough has been done in five years. And that’s as it should be, for there is much to be held to account, still. It is ironic how fortunate I have been to come to know so many people as a result of the events of January 12, 2010. Today, I share the reflections of some of the friends, colleagues, and former coworkers from my 3 years in Haiti: why they are hopeful for Haiti’s future, or how working in Haiti inspired them. Here is what Haitians – and friends of Haiti – have to say today. Port de Paix/Lacoma: supporting CMB hospital with ER supplies and Lacoma with medical/dental team 3 times a year along with long term development plan, including watering system for a sustainable garden. Leogane: working with Darbonne clinic and St Croix hospital to keep its doors open (accomplished) and implement vision to reduce donor dependency within the next 4 years. Canaan: support of clinic in ‘informal neighborhood’ with procuring supplies, medications and donations. “The thing with Haiti is that you just gotta stick with it to see real results. I am sticking with it” she closes. Sara Siana Wasserman first came to Haiti with Lukas Nelson to volunteer with J/P HRO. They sang and played music with local children, and I managed to miss it all, unfortunately. She has since founded Music Heals International, whose mission is to bring music and musicians to the children of Haiti and other parts of the world and to teach and inspire children, using music as a powerful force for education, creativity and healing. “As we reflect on the earthquake of 2010, I can only imagine what the Haitian people experienced. When my friends in Haiti speak about it, I am amazed by their great sense of faith and strength through such extreme devastation and loss. The Haitian people have such an ability to see the light and positivity in any situation; and the more time I spend in Haiti, the more inspired I become. There is a strong sense of family and unity which I know will carry them through anything. 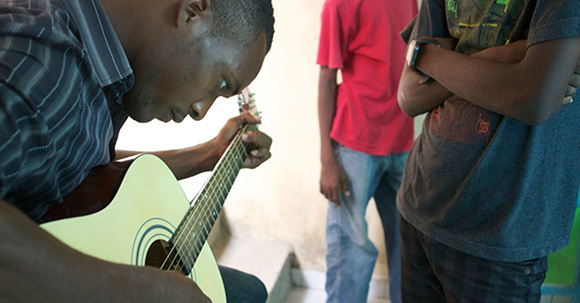 As we have spent the past couple of years building a music program for children in Haiti and watching the teachers we have trained give back to these kids in their own community, it feels much more like a gift to me than to them. I see the smiles on the kids’ faces when they pick up a guitar or play a note on a keyboard, and for a second, it takes them away from their daily circumstances as they are only in that moment. “It has been five years since Haiti got hit by a catastrophic earthquake that killed thousands of people and left a huge part of the population homeless and in extreme poverty. The aftermath of that tragedy is very disastrous. Much effort has been made to help the country moving forward but there is a lot more that needs to be done. In addition to natural disaster, the country indeed faces enormous problems: a violent, spiraling insurgency that is hampering the rule of law and developmental efforts, the growth of record crops of poppies, extreme poverty, criminality, homelessness, joblessness, lack of access to clean water, continuing problems with the status of women. Besides all the problems mentioned above, Haiti still has a chance to have a better future. 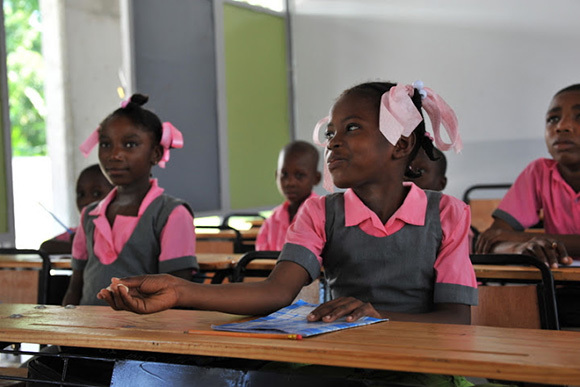 If we accept the premise that Education is the key to achieving positive, long-lasting change in Haiti. We can talk about other solutions when we really touch the basic problem, which is access to Education for the majority of the population who cannot afford it. I am more than sure if the government invests in Education where everyone can have access to school and facilitating undergraduates to study, in the next ten years many things will change. Fig. 3: Sidewalk pavers, containing recycled/repurposed demolition debris material from buildings damaged or destroyed by the 2010 earthquake. Photo by the author. 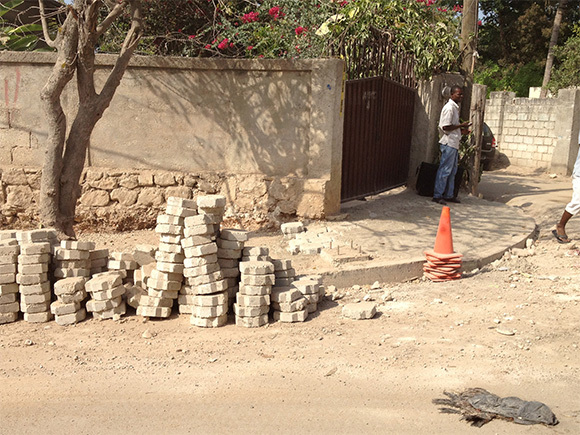 Aline Séjourné helped answer Sean Penn’s question of what might be done with all the rubble from the quake by managing J/P HRO’s production of recycled-material pavers. As Block Manufacturing Project Manager / Social Entrepreneur at Build Change, she is currently focused on another critical issue: helping local independent manufacturers improve the quality of the blocks they produce, especially in raising the compressive strength, which helps the blocks resist crushing. Aline writes that “Haiti is too rich to be poor”, citing Haiti’s plentiful and unparalleled natural resources: coffee (sold in the US, Europe, Asia), vetiver (used in perfumes all over the world), cacao, and mango. She hopes the focus on developing markets will be expanded beyond the capital, Port-au-Prince, to other potential markets outside the city. Jeffrey Smythe – a current messysystems.com contributor who has been active in the recoveries from Hurricanes Katrina and Sandy in the United States – I met while he was volunteering his skills to prepare an emergency response plan for J/P HRO. Schools – which were often built with poor materials and often structurally inadequate – were the single building type most affected by the earthquake, and much effort has gone into replacing them. Fig. 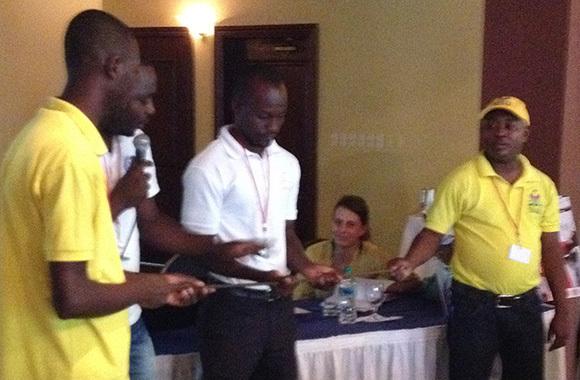 5: Haitian Ministry of Public Works (MTPTC) engineers demonstrate earthquake-resistant construction techniques at the Understanding Risk Haiti conference, 2014. Photo by the author. Jhon refers, in fact, to two guides: the ‘Guide de Construction de Petits Batiments en Maconnerie Chainee’ (Guide for the Construction of Small Confined Masonry Buildings) and the ‘Guide pratique de Réparation de petits Bâtiments en Haïti’ (Practical Guide for the Repair of Small Buildings in Haiti), documents produced by the Haitian Ministry of Public Works (MTPTC), both available here. While the raising the ministry’s capacity to manage permits, enforce regulations, and ensure safe construction is still a work in progress, the publication of the 2012 National Building Code of Haiti is a monumental benchmark worth celebrating. Fig. 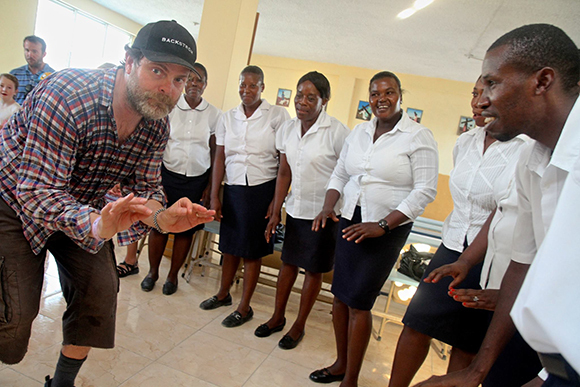 6: Actor Rainn Wilson, in action in Haiti with LIDE. Photo: Nadia Todres. “When my Haitian friends and colleagues talk to me about January 12th, what I always hear amid the loss is what was found that day — unity. “I spent a good majority of my time in Haiti mentoring and teaching two absolutely stellar students literally everything I knew about life, architecture, and design. Their names are Julien Jackson and Erina Tavil. After I left, they started their own organization (Fig. 7 above) to continue teaching what I taught them back in 2011. Not only was the Architecture for Humanity team able to build architecture that will last, but also built up a knowledge base that will continue to last. Small businesses in Haiti struggle, especially those that have anything to do with construction. To be frank, work often goes to the NGOs, and the line between capacity-building and competition can be a fine one, so… high hopes for a better balance in the future, exhibited by Stephen’s example. Figs. 9 and 10: Two projects by J/P HRO in the Delmas 32 neighborhood. Left: microplanning with new homes; shared access sidewalks, drainage, and stairs. Right: site of future co-property multifamily redevelopment. Photos by the author. I won’t detail my time in Haiti with Architecture for Humanity, J/P HRO, and UN-Habitat/Internews from 2010-2013 – you can read more about that here. I once dreamt that another earthquake occurred in some remote corner of the world, and that the first respondents to offer technical assistance were… Haitians. 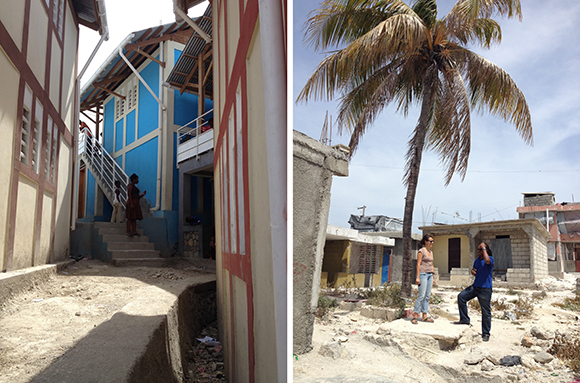 I returned to Port-au-Prince in July 2014 for a conference, and managed to sneak away to visit my former employer, J/P Haitian Relief Organization, to see what they had been up to. I got to see some of the projects I had worked on during my time there. It’s essential to go back and revisit one’s work, I think. Some were finished, some had changed, and some were no longer in use. The best part, however, was seeing those projects (Figs. 9, 10) completed by the teams that came after me. I got to imagine a little bit of my dream – I was something of a stranger in this land, again, as if seeing for the first time the work of Haitians and their counterparts from the international community. But, with a familiar ring. It was wonderful to see how the next generations continued to grapple with issues, develop solutions, and improve upon ways of doing things since the time I was there. In closing, my own hope for Haiti, is, I suppose, not that it achieves perfection, but rather that it will always strive, and in the process, will continue to radiate the hope and possibility for which it has come to be known. Note: This post will remain active for a bit longer. I may be adding the reflections of others as they come in, so please check back, and contact me at regroundllc@gmail.com if you’d like to share your thoughts.